#KareenaKapoor Khan who was present at the #Lokmat awards said, she can't imagine her life without acting. Kareena was present the Social influencer award as the Lokmat Maharashtrian of the Year by Chief Minister Devendra Fadnavis on Tuesday. When interacting with media the actress said, "I think after eighteen years of working in this profession I can't imagine myself;f doing anything else. I have always wanted to be an actor so I cant think or imagine my life without acting." Apart from Kareen, after delivering films such as PadMan and Toilet: Ek Prem Katha, the actor Akshay Kumar was awarded as the Social influencer at Lokmat Maharashtrian of the Year by Chief Minister Devendra Fadnavis. Commenting on Akshay's receiving the award Kapoor said, "There is no one more deserving than him. I think his choices of films are very brave and he always tries to do something different." The Jab we met actress also said she feels proud and humble to be awarded, "All kinds of awards are important but to get an award from your state as the Maharashtrian of the year is something very special. I am very proud of my state and my city. I am true Mumbaikar. I feel very humble to receive this honor." Styled by Tanya Ghavri, the diva looked gorgeous in the 'canary yellow chanderi saree' by Masaba Gupta, that featured 'tribal vase pleats and kalash khadi palla'. The saree had a bright pink border and was teamed with a matching pink blouse giving it a pop of color. 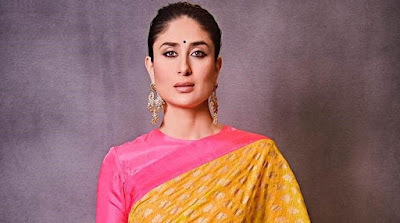 Kareena finished the look with statement earning, khol rimmed eyes, hair tied in a low ponytail. Kapoor will be next seen in Shashanka Ghosh's Veere Di Wedding, a romantic comedy co-starring Sonam Kapoor, Swara Bhaskar, and Shikha Talsania.